One of Derby’s oldest companies is weathering the political storm clouds by preparing for its biggest-ever investment in new equipment. Steel stockholder Eggleston Steel, which can trace its history back to 1809, is defying the industrial inertia by planning to spend almost £1.5m to keep it at the cutting edge of its sector. 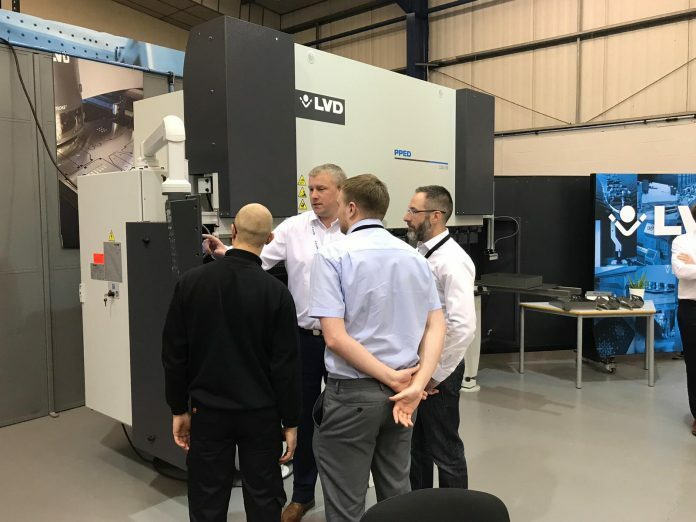 It is buying three new machines for its premises at Alfreton Road – a laser cutting machine, a pressbrake which folds steel plate, and a guillotine. Costing £850,000, this batch is expected to be installed by June. It matches the previous biggest investment of machinery – the most advanced laser profiling machine in the country – made five years ago. The company hopes to then buy a plate processing machine which will cut steel using a plasma process while also being able to drill, tap, mill and counter-sink plates. Eggleston Managing Director Richard Hewitt said this machine uses additional capabilities that are a new concept, something the company does not offer. “It will enhance our capacity and hopefully open new markets for us,” he said. It hopes to have this equipment, costing another £500,000, installed by the end of the year. Together with new software and other ancillary spending the total cost will be almost £1.5m. Eggleston provides steel for customers working on a DIY project to full loads for national companies working in the engineering, fabrication and construction sectors. Its products are used in a wide range – from fire escapes to ducting for power stations and structural steel for buildings.